When you hear the words “drawbridge” and “castle,” what comes to mind? Most people think of a childhood fairytale, but for Noel Sutton, the newest owner of 21 Mayfair, these words mean one thing: home. Sutton recently offered Buffalo Magazine a rare look into one of the city’s most exclusive properties: E.B. Green’s architectural masterpiece, the Mayfair Lane Castle. E.B. Green’s legacy is visible throughout the city of Buffalo. His works include the Albright-Knox Art Gallery, the Goodyear Estate, the Buffalo Savings Bank (the M&T Gold Dome), and Crosby Hall on the University at Buffalo’s South Campus, to name a few. But while this prolific architect’s creations have served as some of the city’s most beloved focal points, one has remained a hidden gem. Many Buffalonians are unaware that he designed an entire Tudor-style village, complete with 20 townhomes and a castle, nestled in the heart of Allentown. This was no mistake. Green intentionally designed the lane to remain inconspicuous, and it has been for nearly a century. He achieved this by building multi-story townhomes with street level garages and elevated front entrances. As you drive or walk by, Mayfair Lane appears to be a carport and nothing more, but if you’re observant, you’ll notice two staircases on either side of the driveway. Homeowner Noel Sutton stands on the drawbridge outside the castle at Mayfair Lane with E.B. Green’s original blueprints in hand. A trip up these stairs transports you to a 17th century English village. The scene is picturesque: a stone-cobbled lane lined with stucco and brick Tudor homes sporting colorfully painted shutters and slate roofs. The lush front gardens add a pop of color in the summer and fall, and become a safe haven for snow in the winter with the promise of not being disturbed by typical street traffic. At the end of the lane, a mysterious copper-topped turret is just visible; the first sign of the castle. The drawbridge that leads to the property is the next sign. A gate, upgraded with automation, separates the castle from the rest of the lane. With the lack of palace guards for hire in the Buffalo area, Sutton has included some 21st century security measures far more intimidating than your standard moat, including invisible motion sensor lines and video surveillance. In other words, he’ll know you’ve arrived before you even stepped across the drawbridge. Despite these additions, the authenticity has remained fully intact. As I walked over the drawbridge, it became clear that I was about to have a transcendental architectural experience. And I did. A view of the great room from the interior balcony. Every surface of the home—from the hardwood floors to the plaster to the wood paneling—was refinished by a historic preservation specialist. Sutton greeted me at the heavy, wooden front door, quintessential to a castle, and welcomed me into the great room. It was sensory overload at first sight. I was unsure of where to gaze first—the 40-foot vaulted ceiling, the intricately designed wood paneling, the fireplace on the far wall, two ornate, oversized birdcages, or the cannons. According to Sutton, the estate explained that the cannons date back to warships from the 1800s, a fact revealed by their wooden wheels, while the 4-foot tall birdcages were crafted and hand-painted in Paris in the 1890s. In the pre-television era, servants would place songbirds in the cages to provide entertainment for the family. As I glanced up to take a closer look, I noticed a balcony overlooking the room—a place for a quartet or carolers to perform in case the songbirds grew tiresome, Sutton explained. He also pointed out that the staircase to this area lies behind none other than a trapdoor (not the only one in the castle). As we crouched through it and walked up to the balcony, he divulged that there’s a surprise at every winding turn, of which he spent months delightedly uncovering after moving in. His favorite discovery to date? An ordinary-appearing closet that, like something out of Narnia, leads to a staircase and secret room. He then disclosed some of Mayfair Lane’s historical background, explaining that the surrounding land that would later become the lane and the original property (the left side of the castle when viewed from the lane) was a home owned by Johannus Letchworth, of the famous Letchworth State Park family. It featured two bedrooms, the kitchen, the dining room and a garage, all of which remain part of the current structure. Letchworth sold the estate to Green, who then turned a fairytale into reality by constructing the castle, completed in 1928, and the townhomes, completed the following year in 1929. “Green purchased an 18th century castle from Denmark, and had pieces shipped to Buffalo where he used them to construct the great room. So even though it was completed in 1928, it’s really much older,” explained Sutton. Cannons, once used in battle on a 19th century ship, overlook the drawbridge outside. The 140-gallon koi pond was part of the castle’s original design. His love for this home, the lane, and the city itself are palpable. As the founder and owner of Sutton Development, a real estate company that focuses on restoration, Sutton has worked diligently to preserve the historical integrity of some of Buffalo’s most architecturally significant structures. As if having a castle in the center of the city could get any more romantic, the story behind it remains its most touching feature. 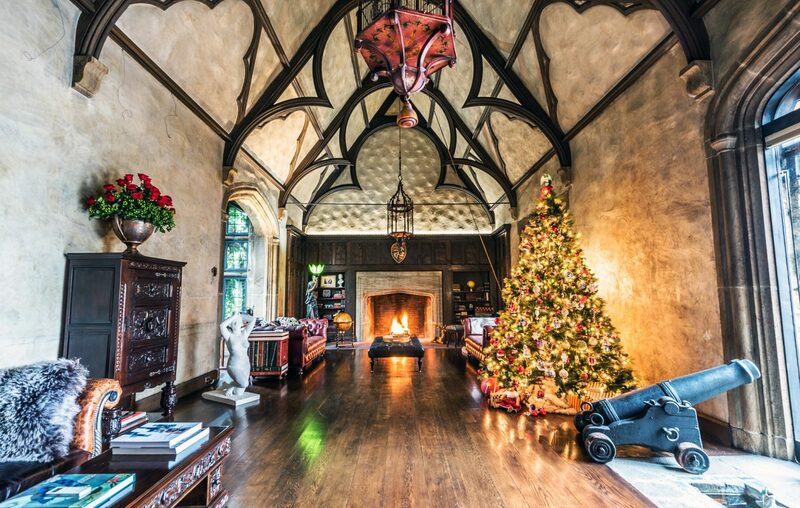 Green built the castle as a gift for his son, the first of the property’s three owners. Sutton is thrilled to carry on the tradition lovingly preserving this historical gem. The dining room features chinoiserie mixed with classic European antiques. Original Delft tile from Holland graces the fireplace. The master bedroom features an antique bedframe sourced from a now-defunct European hotel, purchased locally at an antique shop on Hertel Avenue. A massage room was designed for generating positive energy, says homeowner Sutton. The motif for the home office is “powerful—it says ‘this office is in a castle,’” said homeowner Sutton. It’s finished with an antique desk, custom window treatments, suede walls and a textured, deep red ceiling. Original wallpaper became the design inspiration for this third-floor bedroom, which includes a canopy bed with custom linens and pillows.